INSPECT assists personnel engaged in plant inspection and turn around activities by quickly creating Fitness-For-Service (FFS) assessments for pressure vessels, heat exchangers, piping and above ground storage tanks. It manages inspection data and seamlessly uses thickness surveys to determine inspection intervals and retirement dates. INSPECT makes re-rating pressure vessels simple and helps Engineers make run, repair or replace decisions. IT departments also appreciate that INSPECT does this without the need to purchase, deploy and learn several different software “modules”. Depending on your needs, INSPECT’s API 579-1 FFS can assess individual components, complete vessels or even model entire process systems. INSPECT also reduces regulatory compliance risk by quickly documenting undocumented pressure vessels. And when it becomes necessary to repair your pressure equipment, INSPECT’s integration with our Shopfloor welding management system helps speed up that process too. INSPECT features a 3D inspection data management system (IDMS) that has the unique ability to show CML’s and API 579-1 flaws directly on your equipment models. This 3D flaw visualization includes GPS location information to help quickly locate the flaws being monitored. INSPECT’s 3D equipment models also save money because they make possible the rigorous tmin calculations that can extend vessel remaining life and inspection intervals. 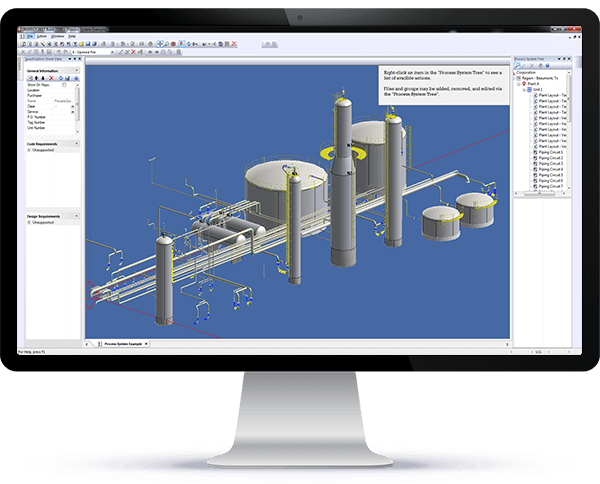 INSPECT is a Fitness-For-Service and IDMS extension of our market leading COMPRESS pressure vessel software. It includes all available COMPRESS functionality and shares the same user interface and file format. This commonality makes the transition from COMPRESS to INSPECT easy and efficient. Users new to Codeware products benefit from an easy to learn user interface that minimizes training time and reduces implementation costs. Taking equipment out of service is expensive but leaving damaged equipment in service can be risky. INSPECT’s Fitness-For-Service capabilities assist Engineers in determining if repair or replacement is really necessary. A wide range of flaws can be assessed including general and local metal loss, pitting corrosion, grooves, dents, gouges and cracks. Complete Part 3 brittle fracture checks automatically support INSPECT flaw assessments as well. INSPECT’s data logger integration can quickly turn thickness survey readings into FFS results and help ensure turn arounds stay on schedule. INSPECT produces detailed API 579-1 remaining life reports that let you verify the calculations performed and provide RAGAGEP support for your recommendations. INSPECT’s mechanical integrity capabilities include a flexible inspection data management system that lets you specify the CML data to track. 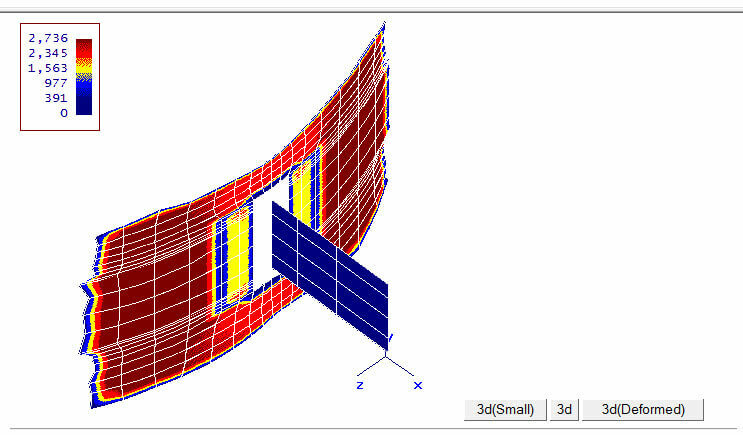 Rigorous tmin, remaining life and inspection interval calculations are built-in. 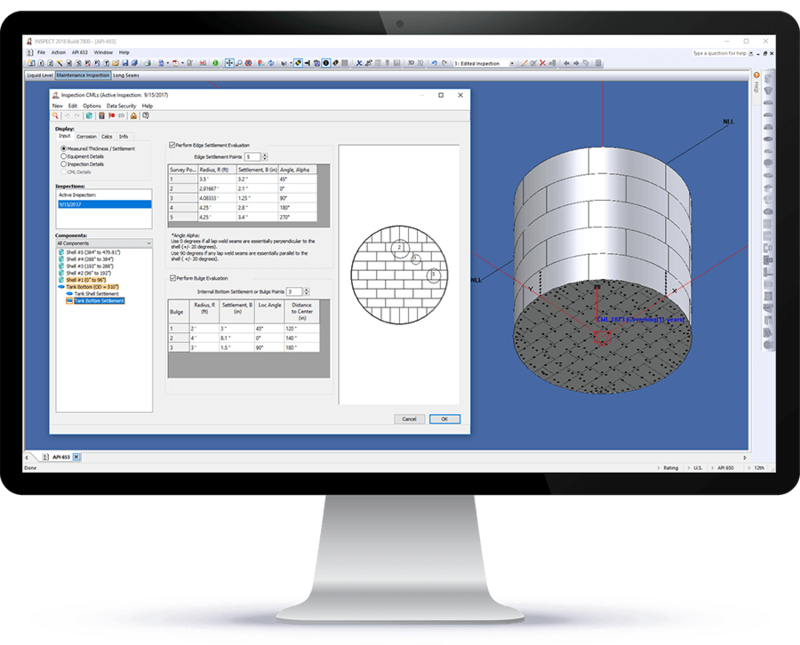 All API 510 and API 570 Code results are supported by full ASME VIII, ASME B31.3, ASME B31.4 and TEMA calculations and reports. INSPECT helps safely extend equipment life and inspection intervals by implementing the most economical Code allowable stresses and weld joint efficiencies permitted by the NBIC / API 510. API 653 storage tank assessments include consideration of shell out-of-plane and edge settlements, floor bulges and patch plates. 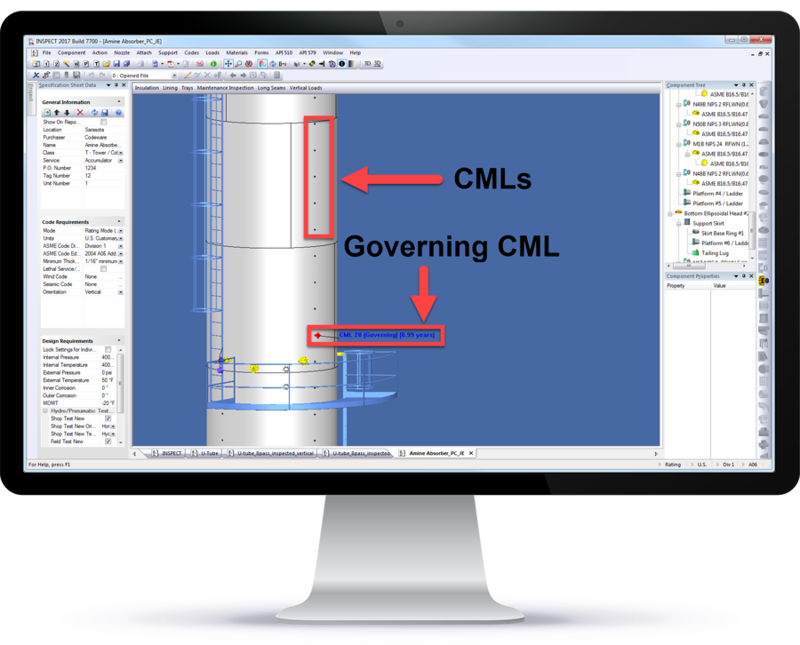 INSPECT, like COMPRESS, can handle complete pressure vessel models. By combining vessel damage information with its location on the physical model, INSPECT takes the concept of inspection data management to the next level. Weld joint efficiency vs damage location, static liquid head, overhead weights, wind and seismic are automatically taken into account. 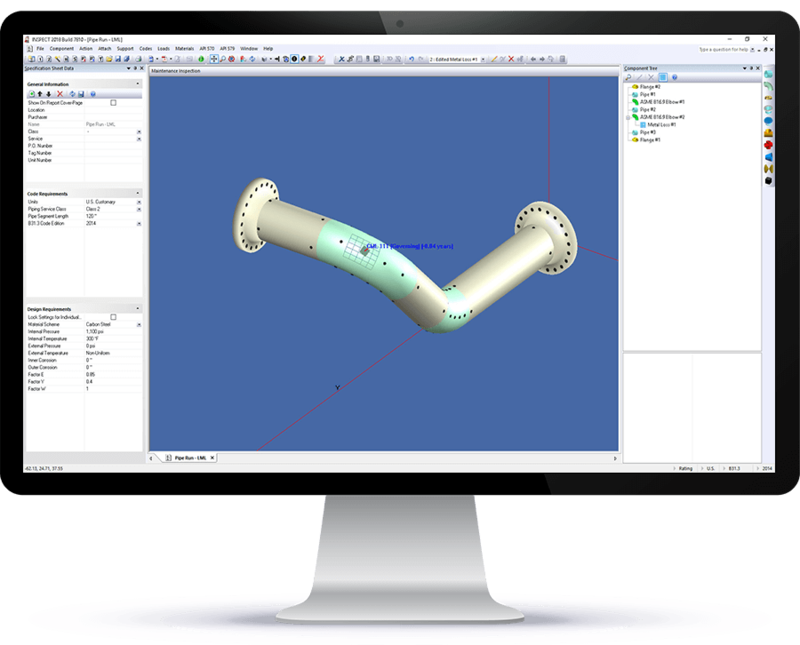 This results in an engineering analysis that is simply not possible with any other Fitness-For-Service software system on the market today. INSPECT quickly performs ASME compliant pressure vessel de-rating calculations complete with supporting design documentation. INSPECT accurately determines what equipment re-rating does to equipment remaining life and inspection schedules. Unlike other mechanical integrity systems, INSPECT produces extensive audit trail reports that document all API 510 calculations performed. API 579 Flaw Locations – GPS locations may now be specified for API 579 flaws. Flaw locations can be displayed in Google Earth by clicking on the GPS coordinates in the corresponding flaw report. Part 3 MAT Charts – API 579 Part 3 pressure versus minimum allowable temperature charts are can now be generated for each flaw. 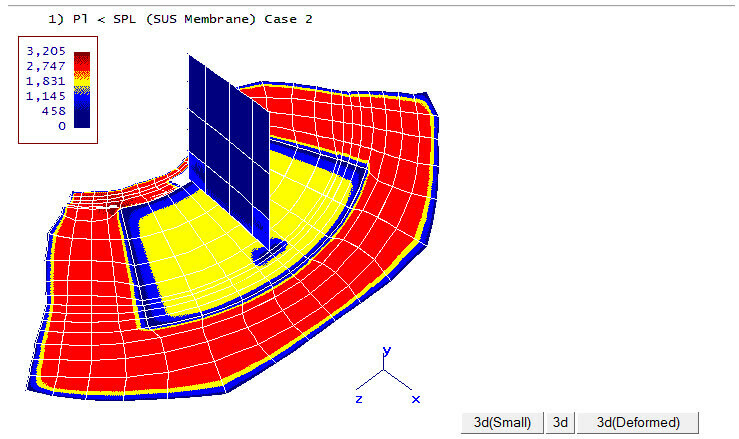 API 653 Nozzle and Roof Assessments – API 653 tank nozzle and roof assessments have been added. ASME PCC-1 – Analysis of bolted flange assemblies per ASME PCC-1, Appendix O is now available. Appendix 13 – Air cooled heat exchangers per ASME Appendix 13 and API 661 have been added. Productivity Enhancements – All recent COMPRESS productivity enhancements including vessel Quick Design are now available.